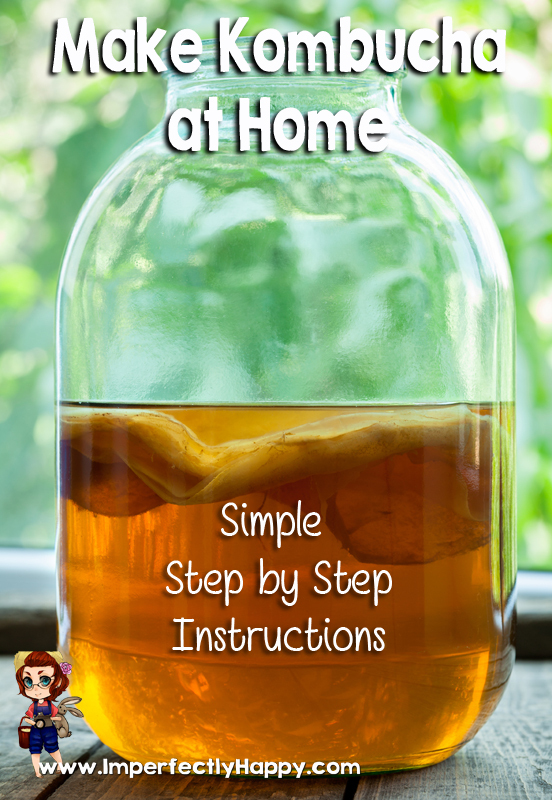 Make kombucha at home – it isn’t as hard as you think; especially with these step by step instructions. My introduction to kombucha came from my sweet friend Donna. So when I decided I wanted to bring the instruction to the blog I went to the source. 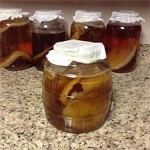 Donna is sharing her experience on making kombucha with you today; I know you’re going to love it. So let’s get brewing! When I was a kid, I remember my dad making what he called “Hippy Mushroom Tea”. He kept jars of his pet “Scoby” on the counter. He praised it for its cleansing effect on the body organs. He thought that this drink was the fountain of youth. I thought that this gelatinous creature that he tended to-about once a week was just gross! I was a young teenager with hobbies of my own, so I could not care less about the golden drink that he was so excited about. Now I wish that he had kept it up, and that I had learned from him. It was not long after dad passed on; that I ran across a friend who was herself “in love” with this pet. She taught me how to keep a pet scoby of my own, and I have been brewing “Kombucha” ever since. 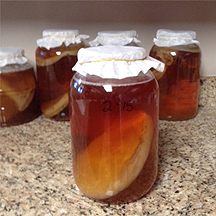 The name “Scoby” is a nonscientific term for “symbiotic colony of bacteria and yeast”. This colony comes together in the form of something that looks like a jelly fish. Mushrooms are fungi, so I have a hard time referring to it as a “mushroom” as many people do. When a scoby is fed a mixture of sweetened tea, it will consume the mixture and excrete probiotics that are healing to our gut, and cleansing to our organs (so I am told). It becomes a sweet/tart fizzy beverage that replaces soda in my house. It also produces a new scoby called a “baby”. Now you have a mother and a baby, and you can use both to make more jars of kombucha, or use one to teach a friend; to get her started with her own brewing project. 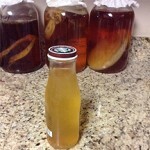 Here is how my friend taught me how to make kombucha. Use stainless steel and glass only. Wash, rinse very well and sterilize all your equipment before using. 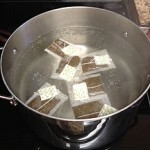 Use filtered water to make your tea. 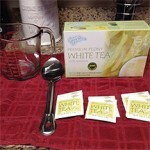 I always use organic white tea (because there is less fluoride in the white tea leaves) and organic sucanat (which is dehydrated cane sugar cane granules). But you can use sugar. In a stainless steel pot boil one gallon of filtered water. Turn off the heat and add 6 tea bags. Allow to steep for 15 minutes. Add one cup of sucanat or 1 1/2 cup of white sugar. Stir to dissolve. Now, place your gallon jar in the sink ( if you are short like me). This will help you pour your dangerously hot liquid into the jar. Fill your jar 3/4s of the way full, and reserve the rest for later. Ok, now go do something else. I don’t care what, anything you want; because you have to wait until this mixture cools to room temperature. 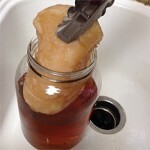 If you put the scoby into hot water, you will kill it. scoby. Place it in your jar, and top off with some of the fluid in your hotel to use as a starter culture. After you have filled your jar, place a paper coffee filter on top of your jar and secure with a rubber band. This will protect your brew from dust. I like to write the date on the jar with a black magic marker. Do not worry, this will wash off with a scrubbing sponge. Then I put it in the line up on the counter. You can now use your reserved tea and any extra scobies to fill up your hotel. You can start tasting your brew with a sterilized spoon after about 10 days. I like mine more tart than most, so I brew for a month (hence 4 weekly jars).When the tea is to your liking; you can harvest your tea to drink, or start a second fermentation. We will cover that another time. When you are ready to harvest your tea; remove the mother from the jar, and strain your liquid through a coffee filter into jars that fit your refrigerator. (Steve likes the iced coffee bottles that my daughter saves for me). The reason that I strain it is because the scoby leaves little goo-ey bits that float in the tea. Many people just drink them. My husband, Steve, says that they remind him of snot. He will not drink it if it has not been strained. gift, teach a class, or have a batch go bad. Yes it happens. I have had my batch get moldy a few times. It is easy to tell; it looks like someone sprinkled black pepper on the top of your brew. When that happens; toss it (scoby and all). I throw it in my compost pile, and cover it up. Mother Earth likes her kombucha with an extra kick! 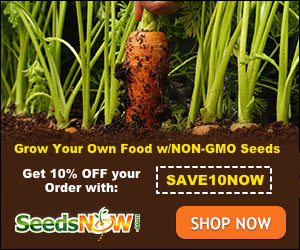 Donna Bruce has been a backyard homesteader for over 30 years raising gardens, rabbits, chickens, goats and tilapia. She has taught these skills at churches, community gatherings and in her living room. She has spoken at the city/town council meetings, and at the state legislature in favor of chicken ownership. She and her husband Steve finally “bought the farm” and now live on acreage where they can expand their flocks and herds. Now that she has more room to grow, she is focusing on community education and artisan cheese making. You can find her, Steve and their Wonder dog Cody on her blog, Facebook and Pinterest. 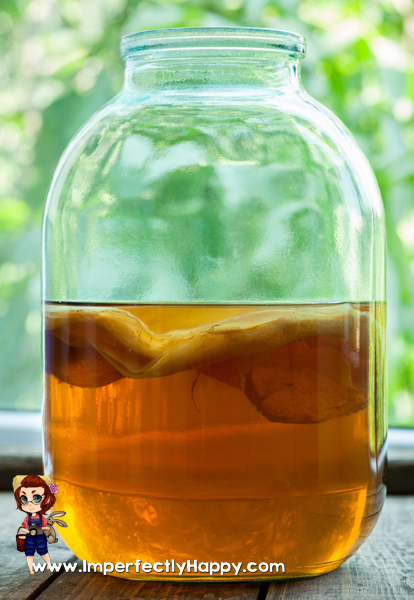 I loved the article and have been wanting to do this for some time now…BUT….where do I find my scoby at in order to get started??? Help I live in Poca, West Virginia. Thank you for your help. I have been wanting to try this for quite a while but have been wondering about the amount of actual sugar in the final product. I imagine most gets used up in the fermentation process. Do you have any sources for nutritional information. I’m pre diabetic and need to watch how much sugar i take in but this looks so good. Most of the sugar is eaten up in the fermentation process.